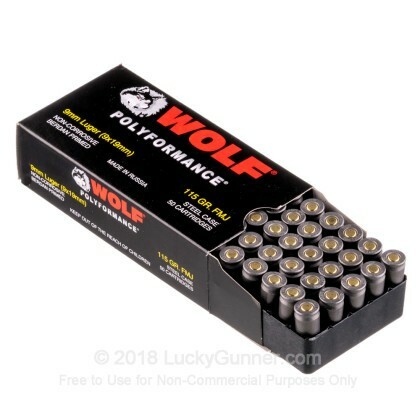 Newly manufactured Wolf WPA Polyformance Ammunition! I purchased 500 rounds of this brand. Ran about 300 rounds threw my Sig P250 (9mm). Yes, I did get some hickups/misfire prolly twice. Didn't ruin my range experience nor do I dislike the ammo. I have a couple of boxes left. I'll finish them and try another brand. All in all I was satisfied. Ran through 60 rounds through a P228 without a hitch. There were no issues that some people may have experience with firing steel case rounds were noticed. I've found that the accuracy was also good and for the price these go for, you definitely can't go wrong. Picked up a box of these to give them a try and see if some of the bad reviews were warranted. 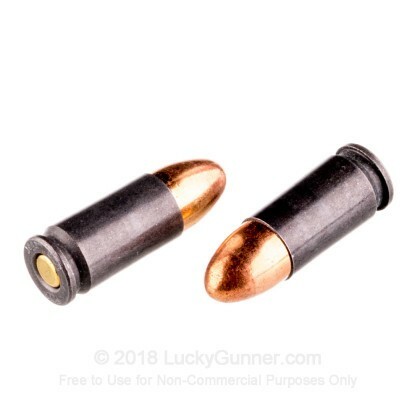 Having had previous experience with Russian made, steel-cased ammo I was not disappointed, these fire fine abate light making me suspect they are using a light load, or even possibly sub-sonic load( don't own a chronograph so I can't test that myself) which in some guns that have a hard drawback may result in ejection problems. As far as leaving the gun dirty, I can't really complain too much, I've had high dollar american made ammo leave as much residue(or more) as these rounds. So all and all I'd have to say good disposable for the price. P.S. Yes I did have some ejection jams with this ammo, but considering I was also teaching a new shooter it worked out great since it gave a unpredictable live jamming situation, and also provided another nice teaching tool with my Walther PPQ M2, the ammo failed to push the slide back far enough on a empty mag for it to lock in place, made for some nice FTF scenarios. GREAT AMMO FOR THE MONEY!!!! These rounds flow flawlessly through my Ruger P95. No issues at all. Will definitely be purchasing more. I recommend this ammo to anyone who loves quality ammo at a awesome price. On the bright side it has gone bang everytime so far (150 rounds into my 1000 rnd purchase) and this is good ammo for practicing failure drills but beyond that it is just FAIL. The issue is for some reason it has issues jamming up down inside all 6 of my SR9 magazines. I'm close to the 2k round mark with this weapon and other than 2 FTEs and 2 light-strikes very early on (within the first 100 rnds, but a fluff and buff and a thorough cleaning solved those issues) it has been perfect. It has had a combination of, well everything. WWB, Blazer steel and brass, Tula, Federal +P, Remington, etc. sometimes all in the same mag and no issues. For the last 75 rounds of today's range time I sprayed a bit of Break-Free down into each mag and that seemed to solve it but such steps shouldn't be necessary. As I said, Tula, which has a lot in common with this, feeds, fires, and ejects just fine so I can only assume it has to do with the polymer coating on this ammo. I highly recommend trying a 50rnd box first before buying the 1k like I did. good practice ammo. the casings are not as slippery as brass, and will sometimes not feed correctly in the mag. if you clean your gun after the range, the dirtiness won't bother you. What can I say? It goes bang every time you pull the trigger, the price is great, and performance is great will defiantly buy again, also lucky gunner had the ammo at my house two days before their quoted date, I couldn't be happier with this purchase. 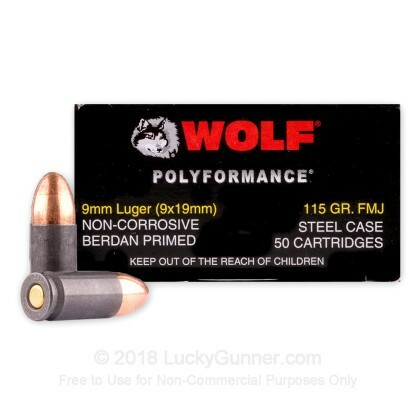 I bought this Wolf WPA 9mm ammo , 500 rds , hoping it would be ok . In my S&W m&p pistol it works as good as anything I have tried , fires every time and is clean burning . I picked up 500 rounds to try in my new Taurus PT92 and I am impressed. 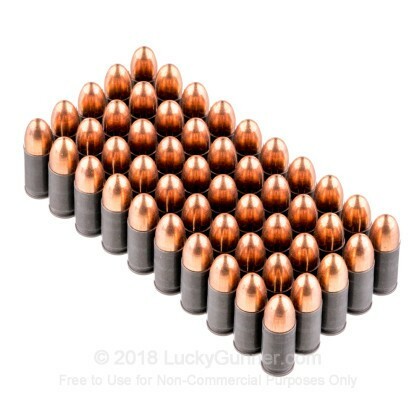 Not a single problem with this ammo at all except that you eventually run out. If you are like me and shoot on your own property then the steel casings are a plus because clean up is make easy with a magnet. 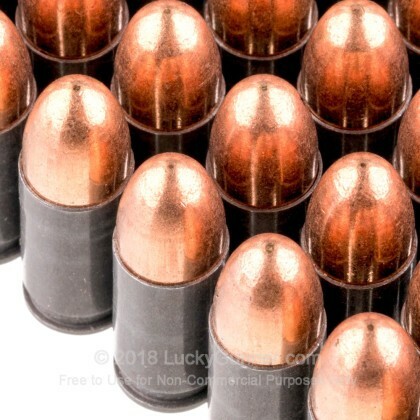 I have shot a couple of boxes of this 9mm with no issues. I have shot it out of two Glock Gen 4s, a Luger, and a P-38. No issues, no jams, no failures to feed or extract. This is a good value. Q: I like the yellow box polyformance rounds for other cartridges. I'm wondering if this too uses a copper metal or bi-metal jacket. A: Hi Andrew. 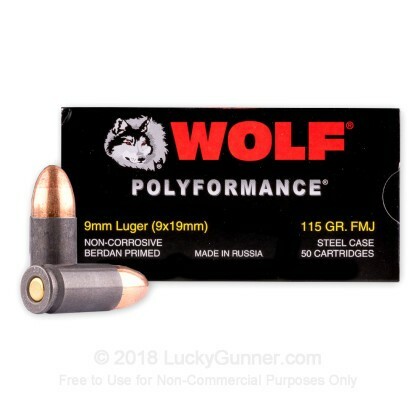 This Wolf 9mm will have a bi-metallic jacket so check with your local range to make sure they allow this before ordering. This is a great ammo at a great price, but many ranges do not allow the use of bi-metallic jacketed bullets. Q: WPA 9mm worked well during Beretta 92FS test fire? No FTF/FTE? A: If you have the opportunity to do so, I would recommend viewing our 500rd page that offers this Wolf WPA 9mm ammo in 500 round lots. Here you can check out a video with this ammo in action on a few different firearms. The Beretta 92FS just happens to be one of those! This may be found on our 9mm ammo page, with this link located to the left side of our site. If you scroll down to some of the 1,000 round lots, you should be able to find videos embedded for these products as well. We will offer these items by the box of 50, just like this one, if you are interested in trying out a few in your firearm. We hope you enjoy the footage and please let us know if you are unable to locate these. We also have this 9mm - 115 Grain FMJ - Wolf WPA Polyformance - 500 Rounds ammo in stock in a bigger quantity.